I read this article and found it very interesting, thought it might be something for you. 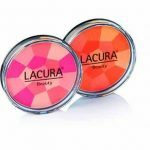 The article is called Lacura Beauty Mosaic Blush Makeup Review and is located at https://homemademasks.net/beauty-blog/makeup-reviews/lacura-beauty-mosaic-blush-review/. I am using this for about 2 months now, even though I do have other options of Blush in my cosmetic bag. I am truly happy with this lovely natural peach with tones of coral Blush and just a hint of shimmer. It really adds to a natural subtle glossy look. You can find it at Aldi also in shades of pink. The price is really cheap as any other Lacura cosmetic product (I think I got it for £0.99 or so). I would even dare to say that in terms of quality can easily compete with major brands like Lancôme or Estee Lauder. It also stays put all day, and looks very nice creating a natural image of freshness to the cheeks. The really downside to this blush is the packaging. As you can see in my picture, it just doesn’t look glamorous. I might probably wish too much from a product that has such a really low price; but Lacura range has so far proved that they can have lovely packaging to their moisturizers and other cosmetics.